Celebrating the spirit of hard-work and success, the Gorkhaland Territorial Administration (GTA) yesterday bestowed "Gorkha Gaurav" honour on the Gorkha Youth Icon Ms. Roshni Rai. Roshni Rai who through her initiative Run with Roshni has become a force of change amongst the Gorkha youths. Through her endeavours Ms. Roshni Rai has constantly highlighted the "identity Crisis" faced by Gorkhalis in India, and has helped in changing people's perception towards Indian Gorkhalis. 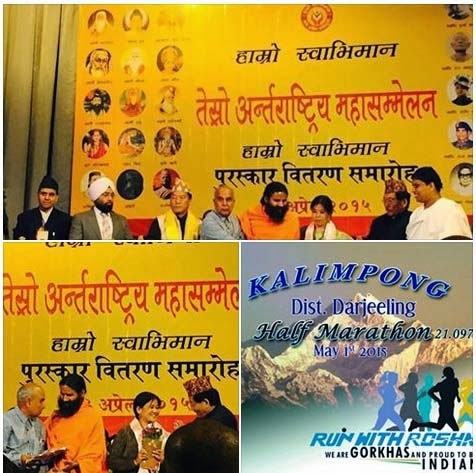 Ms. Roshni Rai has constantly collaborated with TheDC in promoting various social programs, and from amongst which the upcoming Kalimpong Marathon on the 1st of May is the most important. We wish Roshni luck and THANK HER for being so inspirational and a role model that our youth can proudly follow.